Which classes cover the material I want to learn? With the introduction of new flexible/interdisciplinary majors, new classes and the likely divergence of a studentʼs interests from their advisorʼs/upperclassmen friendsʼ, it is getting harder for students to identify the best classes to take, especially to learn about material at the intersection of traditional fields. Which classes match my learning style/objectives? Some students prefer lab-heavy classes, others prefer PSets. Some students want a light class to make time for a UROP, others want the 30 hrs/wk monster. How good the textbook is matters differently to students, etc etc. While Subject Evaluations collect plenty of information, it is locked up in a hard to access and compare format. connections between classes within and across departments. (workload, feedback, overall rating etc), enrollment, professor, department etc. similar material (within and across departments). Also see connections based on professor, etc. WhichClass has the potential to make the class selection process significantly faster and easier. It will reduce search processes like the one in the example to just a few minutes, and make it much easier for students to leverage the rich diversity of classes offered by different departments (as well as the information locked up in Subject Evaluations) to make better choices. Campus Preview Weekends (CPW) at MIT plays a big role in students’ decisions on whether or not they want to come to the school for the next four years. A key factor for students is their experience with the people that they meet that weekend, particularly other admits. Oftentimes, the first thing admits do after the visit is try to find the other admits they meet on Facebook. While sometimes successful, other times it can be a frustrating process because of issues such as forgetting how to spell their names, multiple entries of the same name, etc. MIT has tried to tackle this problem in the past by distributing USB devices that allow for the exchange of contact information via infrared signals, but this has quickly become obsolete in the increasingly mobile world. touchBase has created a business card that looks and feels like a traditional paper cards, but its information can be downloaded to a touchscreen smartphone with just a simple tap. They want a pack of these personalized business cards to be given out to each admit during CPW as a part of their welcome package. The business cards leverage of the capacitive touch technology that is present in all touchscreen smartphones, regardless of operating system. Embedded within each card is a thin layer of conductive material. The conductive material in each card is arranged in different dot patterns, thus registering as if they were “fingers” touching the phone at different positions. When the card is tapped on a smartphone, the associated app will identify the unique pattern and download the contact information from a cloud server. Prior to coming to CPW, users can specify what information they are willing to share via the cards. If they wish, users can even choose to provide a link to their Facebook accounts to make for easy “friending”. Source: Yeung, S.T. (2013). touchBase. As a freshman coming to MIT, many students have no clue what a terminal was or how it could be used to interact with the computer. The main computing environment available to students in Athena clusters is Ubuntu Linux. While using the terminal is not required to use the Athena computers, the ability to navigate the command line interface is a powerful tool in computing at MIT. The problem is clear: students who first are exposed to the Linux terminal on Athena do not know how to approach learning it they learn painfully slowly by accidentally hearing from someone else that a particular command exists. These students are not using the Athena computing environment to the fullest extent. Gamification, play, and fun are arguably the most effective ways of learning a skill. The Terminus team wanted to combine play with the tedious (and often difficult) task of learning how to navigate a command line. At the same time, they wanted to throw some nostalgia at MIT students. The solution they came up with was a text-based adventure game entitled Terminus, aimed to teach the player to use the command line with basic commands. You are placed into a magical world where you are forced to explore the world with the “cd”, “ls”, and “less” spells you are allowed to “touch” objects, “mv” things, and interact with interesting characters and locations. Your tasks are numerous and interesting you are forced to explore every item you see, talk to every character, and visit almost every location. But you are allowed to do this at your own pace with minimal guidance. Rather than spinning this as a learning experience, the main goal is to have fun exploring a textbased adventure world. They want to make the command line less scary, but at the same time riveting and engaging. With the addition of graphics, a plot line, comical text, and a set of silly challenges, we hope to immerse the user in the world, getting them more familiar with the standard commands used in a terminal interface. We have observed that MIT undergraduates across dorms feel that the housing assignment process, particularly for returning students, is unnecessarily slow, manual, and prone to mistakes. Digitized floor plans and rooms for better representation, display, and accessibility. Zero-step log-in system (simply click on a dorm building) that uses certificates to directs users directly to their floor. Intuitive interface that distinguishes between admins and residents, allowing only the former to start lotteries, add residents, and set building information. Convenient .csv-format export feature that will allow information to be stored and manipulated offline. Clear instructions and tips where appropriate to guide users quickly through the web app. Source: Abid. A. (2013). Lounge. Recording video is expensive. You have to buy costly equipment, hire a cameraman to operate it, and then waste hours editing. And for universities that want to record video lectures for their students (or for initiatives like OCW, EdX)… it’s neither cost effective, nor scalable. That’s why – despite the high demand for lecture videos – only 2% of MIT OCW videos have lecture videos attached to them. Differentiating factors? There has been a lot of work in lecture video editing/recording, but much of it has focused on emulating the cameraman. EduCase takes a different approach. Puts students first: A single cameraman can never capture the dynamic nature of a lecture. Therefore, EduCase has multiple cameras so that the entire scene can be captured (not just a small subset.) During a lecture, students are multitasking. They may be taking notes/referring to a previous board while listening to the professor lecture about the next topic. A cameraman/single-camera system makes this multi-tasking impossible — no good way to determine what the student actually wants to look at. Furthermore, the use of the Kinect enables EduCase to filter out, and “look behind” the professor to see the future board. Intelligent system: EduCase will automatically focuses on the correct board by using the Microsoft Kinect to track the professor, detect gestures (e.g. writing or pointing to the board gesture,) and do voice recognition. Scalability: Because EduCase will use multiple smaller cameras to capture the view rather than a single high-quality camera with complex panning/zooming features… the system will be relatively portable and inexpensive.  Expandable to non-traditional lecture settings: because there’s a trend away from the traditional lecture-hall format, the system will be designed such that it is easy to add functionality by simply recording new gestures. To summarize – EduCase is the easiest, quickest, and cheapest way to record video lectures – no cameraman, no hours wasted editing. Professor walks, folds open his EduCase, and presses a button for a hassle-free-lecture-recording experience. Impact: We hope that by the end of this project, EduCase will be considered a promising video-lecture recording approach by the OpenCourseWare community, and bring us one step closer to our overarching goal of education for all. Source: Itani, S. (2013). eduCase. Many MIT students pursue short-­‐term work opportunities to gain insights about fields or industries that they would be interested in working. These opportunities are offered all over the country, but in order to participate one needs a place to live. Not every summer internship program can offer housing to its participants. So in order to find housing, students turn to the Internet or the family and friends. There are problems with both approaches. The Internet has a few types of websites that don’t serve the short-­‐term temporary housing market very well. There’s Craigslist, which is a free service, but you have to be wary of scams and their website is not designed to support detailed searches; there are sites that are tailored to short term housing listing, but one has to pay to get information to connect with someone and that business model does not seem convenient for students; there are free housing search sites, but they are geared for longer term housing commitments. 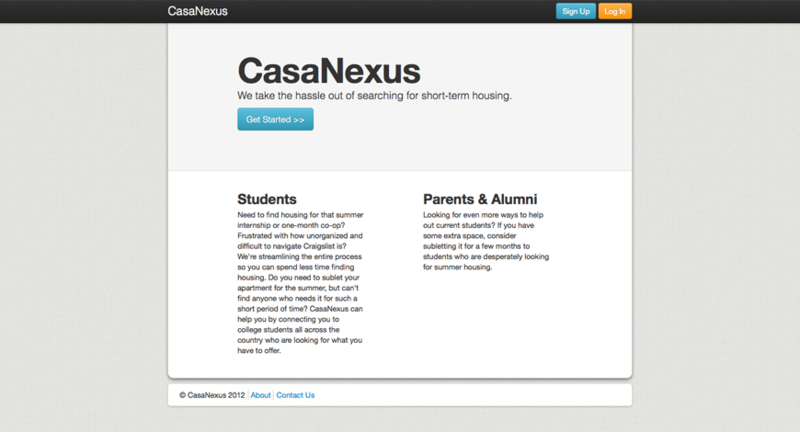 CasaNexus will address these needs by providing an easy to use interface for posting and searching for housing. Team: Connie Chan ’12 and Moji Jimoh ’12. Picking up a copy of the MIT Bulletin it’s easy to immediately discover exactly how complicated planning out class at MIT can be. Sorting between the intricate web of pre- and co-requisites while trying to figure out what the HASS and CI requirements had to do with each other quickly became a daunting task. CourseRoad builds a user-friendly page where users can map out their classes through their undergraduate careers. CourseRoad presents the user with a vertical timeline of her undergraduate semesters, and makes it easy to add, remove, and drag classes between terms. The site then provides a web of prerequisite and corequisite connections behind the class modules and visually alerts the user to any conflicts. Meanwhile, the left vertical bar provides additional information on selected classes and generates a handy table of the user’s progress through the GIRs. Future additions to CourseRoad will allow users to select degree requirements for particular majors, to save and share their course mappings with others, and to better control course options (such as overriding prerequisites with special permission from an instructor). Dormbase is an open-source dormitory database system that is flexible and expandable. The Dormbase project provides a dorm management system that can evolve overtime to suit the changing needs of the various dorms and their residents. Team: Kojo Acquah ’14, Alex Chernyakhosvky ’14, Cosmos Darwin ’15, Drew Dennison ’13, Chris Dolan ’13, Isaac Evans ’13, Dwyane George ’15, Chris Klingshirn ’15, Luke O’Malley ’14. Students looking for STEM internships, either for the summer or an academic semester, currently have no easy way to search for them. A student leaning toward a computer science major at MIT, for example, would have to look up individual university websites and individual company websites to find a CS internship opportunity. Once students have manually found links to these internship listings, they then submit separate applications to the various program coordinators. The problem now is that seeking out STEM internship opportunities is rather like trying to find a needle in several haystacks. It is a tedious, time-consuming and highly serendipitous process. Currently, there isn’t a single web portal that aggregates all possible STEM internships from small startups to large biotech firms to universities to government agencies like NASA. STEMid (STEM internship database) is a web platform that aggregates STEM (Science, Technology, Engineering and Mathematics) internship listings scattered across the internet with a web 2.0 user interface. It seeks to be a two-sided portal connecting students and applicants to STEM internship providers, while streamlining the application process. For students, STEMid offers tools to save and compare positions, filters (location, research topic and level) and ways to keep track of application deadlines. For internship providers, both academic and commercial, STEMid enables administrators to post internship listings and integrate the database with their own internal IT systems, thus offering a way to manage their listings in real-time. Team: Ignatius Chen ’13, Melissa Choi, Roodolph St. Pierre and Marc-Dannie. Tango is an academic network that connects students to classmates from the start during class registration. On Tango, you can pick your current classes or future classes you’re interested in and see potential classmates and teammates also considering similar classes. This lowers a lot of market inefficiencies and barriers to catch missed connections to possible study groups or project teammates. Furthermore, academic planning at MIT can often be daunting and filled with second-guessing. Tango helps students find upperclassmen who’ve been through similar situations. Each course page has an open Q/A forum where students can find answers to class-related questions and critical advices from veterans. Your social network shouldn’t simply be defined by classes at MIT but neither should they be limited by the same classes. Our platform also helps friends plan regular meet-ups like lunch or study-sessions by mapping out their class locations on campus throughout the week, allowing them to figure out a common meeting place. Team: Ray Li ’12, Jessica Lin ’12, Sarah Rumbley ’12.